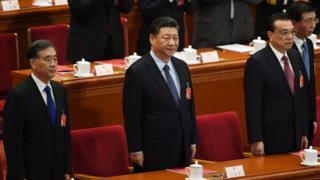 China has passed a new foreign investment law in a move widely seen as an effort to facilitate US trade talks. Delegates voted overwhelmingly in favour of the law on the final day of the National People’s Congress (NPC). The measure is seen as a possible olive branch to the US as negotiators from both countries work to resolve their bruising trade dispute. But some argue it does not fully address the concerns foreign firms have about doing business in China. Delegates at the NPC – the annual meeting of China’s legislature – passed the bill with 2,929 in favour, eight against and eight abstentions. The law will come into effect on 1 January 2020. It comes roughly three months after a first draft was discussed, a particularly fast turnaround in China, as Washington and Beijing work to resolve their trade dispute. The trade battle has seen both sides impose tariffs on billions of dollars worth of one another’s goods since last year. The BBC’s Stephen McDonell said the Chinese government appears to have rushed through the investment law as an olive branch to the US amid trade war negotiations. Many in the business community in China see this law as a kind of sweeping set of intentions rather than a specific, enforceable set of rules, he says. They fear it could be open to different and changing forms of interpretation. The new law aims to create a more level playing field between domestic and foreign businesses. In a statement earlier this week, the American Chamber of Commerce in China welcomed the “legislative effort to improve the foreign investment climate”. But it said some provisions were “still quite general and do not address a number of the persistent concerns of foreign companies or foreign-invested enterprises in China”. Can India's economy keep up its current growth rate?